by Talen on January 15, 2011 in Thai Festivals, Thailand Event Calender 7 Comments - Leave a comment! One of the more unique and popular festivals in Thailand is the Bo Sang Umbrella Festival which will be taking place next weekend in Bo Sang on January 21st through January 23rd. Near Chiang Mai, Bo Sang has carved out it’s own unique identity due to the wonderful craftsmanship of it’s resident artisans. Particularly Bo Sang is known for it’s beautifully painted parasols hand made from silk and mulberry paper. The parasols are hand made then hand painted in beautiful floral motifs with amazingly vivid colors. 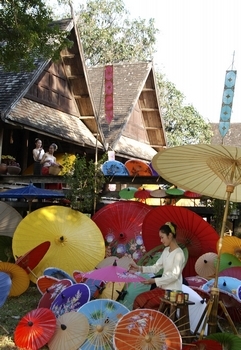 The Bo Sang Umbrella festival is a time when all merchants and residents decorate their houses and shops with the brightly decorated umbrellas and traditional hand painted lanterns transforming the village back in time to the traditional Lana Thai style. In addition to all the beautiful parasols on display and for sale at the Bo Sang Umbrella Festival there will be all kinds of other handicrafts for sale as well as exhibits, cultural shows, contests, a parade and the Miss Bo Sang Umbrella Festival Beauty Pageant. This is definitely one of the more colorful Thai festivals of the year and it definitely rivals neighboring Chiang Mai’s annual Flower Festival. As the name suggests, the umbrella’s take the main stage at the Bo Sang Umbrella Festival and tourists come to Bo Sang from around the world to take part in the festival and buy these special hand crafted items. This truly is a beautiful Thai festival and one not to be missed! For more information on teh Bo Sang Umbrella Festival you can contact the Tourism Authority of Thailand below. 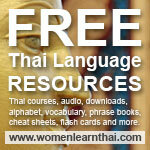 And for more information on upcoming Thailand events and festivals you can check out the Thailand Calender of Events. Good lord Talen, another festival! Any excuse for a party I guess. I enjoyed the umbrella factory we visited in 2009. The process of making the parasols from scratch is interesting. You can also have them custom painted or have anything painted for that matter. Stray had a small elephant put on his shorts. Others were having hats and bags decorated. Snap. looks like I was wrong…seems a lot of people would be interested in panning for gold…I can’t help but think that some of the locals might not be too happy with this idea though…especially if it takes gold out of their pans. Eh. The umbrella festival was Ok. Although in all fairness we went when nothing was going on so we just walked the main drag. A CM native recommended we go in the morning but nothing was happening. I guess it gets very crowded and hot in the afternoon and evening. But, yeahhh – you better visit us lovely ladies since you keep talking about it! Talen, I so love umbrellas. In several of my trips to Chiang Mai I stopped by the umbrella making factories. They are very touristy, but I still enjoyed looking around and picking up their latest designs.